Total petroleum hydrocarbons, or TPH, is an all-inclusive term that refers to a large group of chemical compounds that are originally found in crude oil. Because there are hundreds of types of hydrocarbons, scientists typically measure the total, or TPH, rather than measure each hydrocarbon separately. When TPH is listed as a contaminant at a site, it means that some, and often not all, types of petroleum hydrocarbons are present. Some well-known TPH compounds are benzene, kerosene, and naphthalene. Some components of oil and grease may fall under the TPH classification. 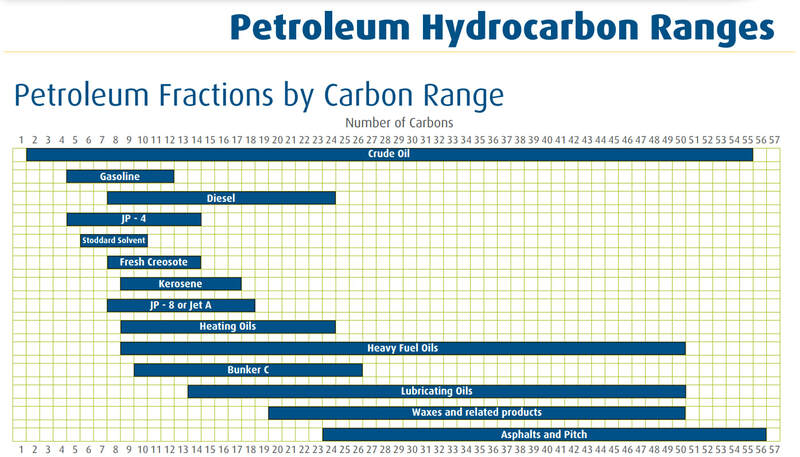 ​TPH can be broken down into ranges based on the number of carbon atoms present. GRO (gasoline range organics) typically refer to petroleum hydrocarbons with a range of 6-12 carbon atoms. DRO (diesel range organics) typically refer to petroleum hydrocarbons with a range of 10-28 carbon atoms. ORO (oil range organics) typically refer to petroleum hydrocarbons with a range of 20-35 carbon atoms. How does TPH enter our environment? Petroleum products like fuel (diesel, gas) and oil are made from crude oil. Improper disposal, leaking machinery and vehicles, and spills are some ways these substances enter the environment. Substances may be illegally dumped into sewer systems or washed into rivers and lakes during heavy rains. TPH may seep into groundwater systems. How are people exposed to TPH? TPH is common in the environment, and people are exposed to TPH from a variety of sources. This can include breathing the air at gas stations, drinking water contaminated with TPH, and wading in sediment contaminated with TPH. Can TPH harm my health? Yes, but the specific health impact varies based on the chemical compound. Some TPH compounds affect the nervous system. Others affect the immune system. Animal studies show that some TPH compounds affect reproduction and developing fetuses. One TPH compound, benzene, is a carcinogen (causes cancer).